Over the last three decades of the 20th century, the United States engaged in an unprecedented prison-building boom that has given our nation the highest incarceration rate in the world. Among people with experience in criminal justice policy matters, the “hockey stick curve” of the national incarceration rate is well known; but until now more detailed data on the incarceration rates for individual states has been harder to come by. This briefing fills the gap with a series of more than 100 graphs showing prison growth (and sometimes decline) for every state in the nation to encourage states to confront how their criminal policy choices undermine our national welfare. 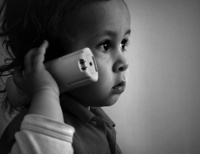 Incarceration rates or incarceration numbers -- What's the difference? Incarceration rates — which control for the significant differences in population size between U.S. states — allow meaningful comparisons between places or time periods of different population sizes. Generally, rates are more useful for policy analysis, but that’s not always the case. 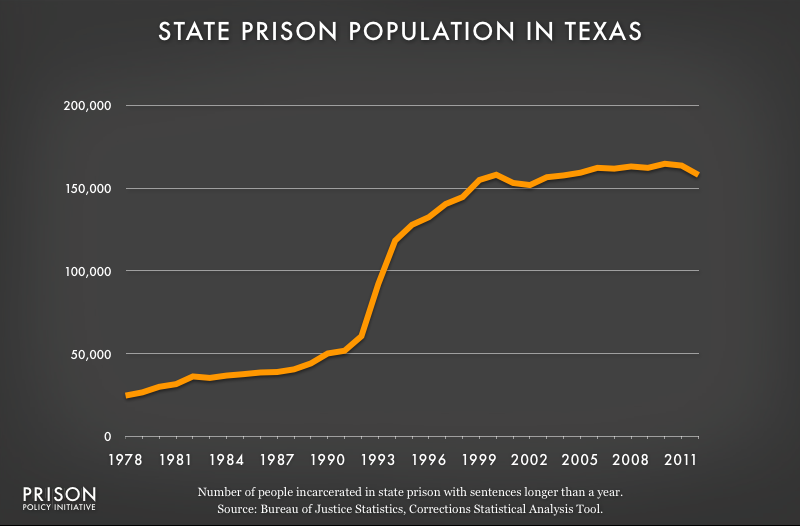 For example, while Texas’ incarceration rate has fallen over the last decade: The scale of that change is far less significant when we take into account the fact that the total number of people incarcerated in the state has remained relatively unchanged: Texas has clearly made a policy choice to stop building more prisons as the state’s population has grown, but unlike New York and California, the state is not making the active choice to shrink its prison population. In the aggregate, these state-level policy choices have been the largest driver of our unprecedented national experiment with mass incarceration, but not every state has contributed equally or consistently to this phenomenon. 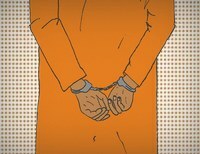 In the U.S., each state is responsible for making its own policy choices about which people to lock up and how for long. We can’t end our nation’s experiment with mass incarceration without grappling with the wide variety of state-level criminal justice policies, practices and trends. Take, for example, the below comparison in Figure 2 of the incarceration rate for the United States (in yellow) with data from five individual states (in orange). We can see that Minnesota has long been less likely to incarcerate than other states, but also, like the country as a whole, markedly increased its use of imprisonment in the late 20th century. On the other extreme, Alabama and Louisiana have consistently maintained above-average rates of incarceration, and their use of the prison continues to grow. Figure 2: Focusing on only the national trend obscures the large and varied differences in both the pace and direction of state changes over time. Figure 3: For the last 30 years, there have been clear regional differences in states' use of the prison, with the southern states relying on the prison the most often. During the early part of the national prison boom, all of the states walked lockstep together to increase their use of the prison. In the last decade, some individual states gradually started to reverse direction. As more states realized that mass criminalization is counterproductive, the aggregate national figures also reversed. Two decades ago, the idea of reducing any given state’s use of incarceration would have required a great deal of imagination. Today, we have the benefit of being able to compare states that have made dramatically different criminal justice policy choices. With this briefing we give state-level policymakers and advocates another opportunity to get involved, and to look at the larger context of incarceration in their state and to develop strategies that will make their communities stronger and safer. This briefing is just a starting point. It’s time to get going. Regional incarceration rates, 2010: Bureau of Justice Statistics, Prisoners in 2010 Appendix Table 9. State prison populations, 1978 to 2012: Bureau of Justice Statistics, Corrections Statistical Analysis Tool (CSAT) - Prisoners showing the jurisdictional population in “State Institutions (Total)” that has a sentence of at least a year at the end of the given year. Notably, we used the “custom tables” option rather than the quick tables because it appeared that the quick tables did not contain some updates to the data. Jail populations 1983 to 1999: Bureau of Justice Statistics, Sourcebook of Criminal Justice Statistics 1999, Table 6.21. Jail populations 2000 to 2011: Bureau of Justice Statistics Jail Inmates at Midyear 2011 - Statistical Tables, Table 1. Jail population 2012: Bureau of Justice Statistics Correctional Populations in the United States, 2012, Table 2. Federal prison populations, 1978 to 2012: Bureau of Justice Statistics, Corrections Statistical Analysis Tool (CSAT) - Prisoners showing the jurisdictional population in “Federal Institutions” that has a sentence of at least a year at the end of the given year. Notably, we used the “custom tables” option rather than the quick tables because it appeared that the quick tables did not contain some updates to the data. Incarceration rates: We calculated the national incarceration rates for state prisons 1925-2012, federal prisons 1925-2012, and jails 1983-2012 using the total numbers above and estimates from the Census Bureau (described below). Because the state and federal prison data is for the last day of the reported year, we used population estimates for January 1 of the next year. The Census Bureau publishes population estimates as of July 1 of each year back to 1900, and monthly back to 1980. Where possible, we used the Census Bureau’s January 1 figures, and for years prior to 1980 we used the July 1 estimates to produce our own estimates for each January 1. Because the jail data for 1983 to 2012 was based on counts as of June 30, we used the Census Bureau’s estimates for July 1 of each year. Because it was not immediately clear to us when jails data for the years 1940, 1950, 1960, 1970, and 1980 were collected, we used the jail incarceration rates as provided by Bureau of Justice Statistics, Historical Corrections Statistics in the United States, 1850 - 1984 Table 4-2. 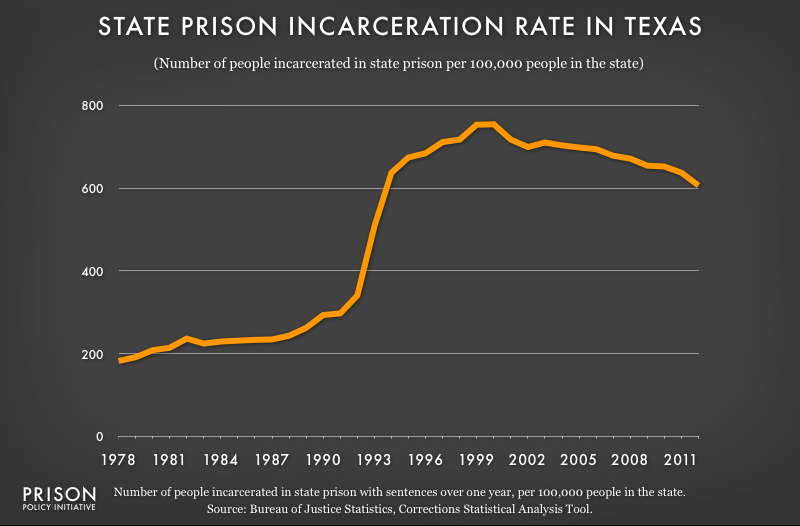 50 state prison population incarceration rate 1925-2012: See What Drives Mass Incarceration? State Policy above for our sources. State prison incarceration rates for Alabama, California, Louisiana, Minnesota, and New York, 1978-2012: Bureau of Justice Statistics, Corrections Statistical Analysis Tool (CSAT) - Prisoners showing the “Imprisonment rates of jurisdiction population - sentences greater than 1 year” for each state. Notably, we used the “custom tables” option rather than the quick tables because it appeared that the quick tables did not contain some updates to the data.